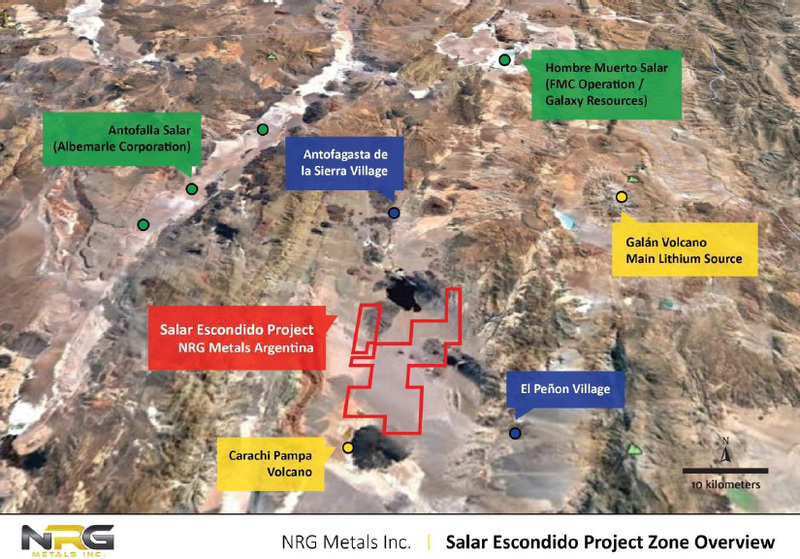 September 18, 2017 / Vancouver, BC / NRG Metals Inc. (“NRG” or the “Company”) (TSX-V: NGZ) (OTCQB: NRGMF) (Frankfurt: OGPN) is pleased to announce that it has awarded the contract for the initial drilling at its Salar Escondido lithium project in Catamarca province, Argentina to AGV Falcon Drilling SRL of Salta, Argentina. AGV has extensive experience in the drilling of salar targets in Arentina, including the Rincon, Cauchari and Rio Grande salars. Drilling on the first hole, which is targeted to be drilled to a depth of 350 m, will commence in late September or early October after a shallow drill water well has been completed. NRG Metals Inc. currently has approximately 68 million shares issued and outstanding, and trades on the TSX Venture Exchange under symbol NGZ, on the OTC QB Market under symbol NRGMF, and on the Frankfurt Stock Exchange under symbol OGPN.